The endless desert is the best fun when you get to ride over the golden sands with your very own desert safari Dubai expert. Don’t miss taking selfies with the endless desert in the background as you make your way to the camp. Here you can enjoy the flavorful Arabic Gahwa and dates with unlimited soft drinks to quench your thirst. Entertainment is a must have in Dubai, hence the traditional tanoora show and belly dancing to add a charm to the romantic evening. Most guests enjoy being dressed in traditional attire and having a henna tattoo for those souvenir clicks. Totally we are a group of 13 and all family members enjoyed it. Our tour guide is Mr Khalid Khan and he is the BEST for sand dunes basing. Its really unforgettable experience. I recommend CityOne and Desert safari to make their trip more memorable and beautiful. Desert Safari is a Must Experience Adventure by anyone visiting the UAE and I knew that this is something my family can't miss out. We were very pleased by the services provided By City One Tours through Ira's assistance - On Time Pick-up, Courteous and Accommodating Driver and Entertaining Program at the Camp. It was a worthy and memorable experience for our entire family. Remarkable Tour- We booked Desert safari for just few hours left. Visit City One Tourism and Travel website. Chatted and Booked with Ms. Jade. But to our surprise there was lot more than what we could expect. The golden dune ride, sunset stop, shisha, the ride on the camel, henna, dinner, live shows, etc. It was really worth the money. Thank you Ms. Jade for being thorough & helping us for our last minute booking. We recommend City One to all our friends going to Dubai. It was a wow experience! Perfectly organized. From pick up, clean Land Cruiser with a professional guide. The 4x4 dune ride in the desert was mind blowing. All of us screamed and laughed to the top of our voice it was thrilling. Perfect control on the vehicle and we felt safe !!! The camp was very beautiful that the others we saw on the way. Camel ride, shisha, henna on hands, shows were all included. We loved the fire man act. Buffet was delicious. Overall it was a 10 on 10 perfect evening in Dubai. Thanks Ms. Jade of City One Tours for good organization. It was fantastic to go on an excursion which represented such good value for money. The safari was well organized, with Ms. Jade on Whatsapp used to effectively co-ordinate our pick up. The car was cool, clean and safe with a polite driver. The trip over the dunes was suitably and thrillingly reckless, and, although the camel farm wasn’t for us, for many it represented one of a number of excellent photo ops. The camp was well maintained, the food more than acceptable and the free drinks copious; even the beer was reasonably priced for the UAE. The entertainment was great, with the fire guy a particular highlight. Thanks for Ms. Jade for helping us to arrange the desert safari tour. We are lucky to have Mr. Nasrullah as our driver. His has good experience in knowing how to drive safely and smoothly in dune bashing session. His excellent service makes this trip in the desert as an enjoyable and comfortable one. It is my third time experiencing desert safari, but this time i may say that it is a perfect one, simply because i have chosen a great partner (City One Travel & Tourism) for making this experience well spent & memorable..from the booking process (with Ms. Jade) down to the actual desert safari adventure. I am overwhelmed with the great effort that Ms. Jade has worked on just to get a date available closes to my friends flight back home..warm hospitality and a 100% customer service satisfaction guarantee..
We booked our desert safari with city tour and we were accompained by Nasrullah, our guide. He is an amazing person, a gem of a person, who is extremely knowledgeable about his job. He was enthusiastic, funny and witty who kept us entertained on the entire trip. He ensured that we get the best value for our money and gave us some tips and recommedations because of which we were able to cover maximum in least amount of time. I would highly recommend Nasrullah and his tour company for Desert Safari. He’ll take you to the best of the sand dunes and his driving skills and knowledge about the desert are exceptional. JOB WELL DONE NASRULLAH! 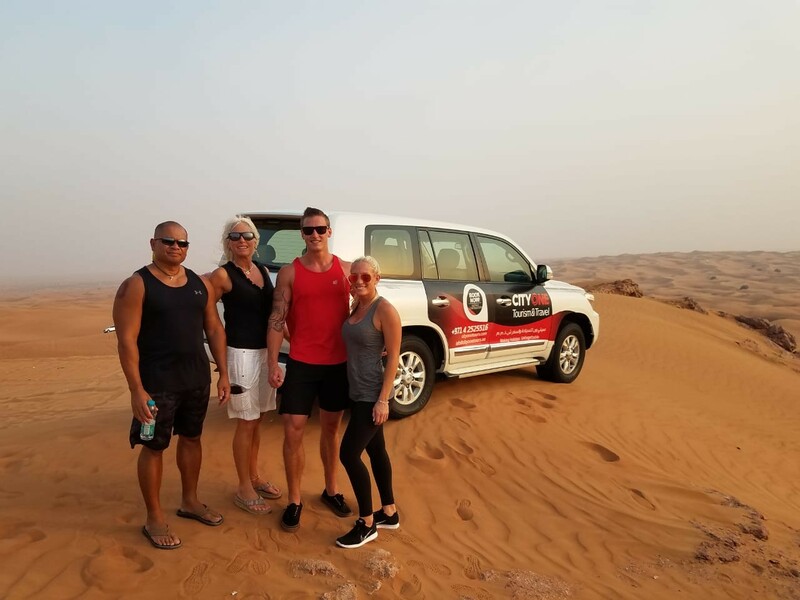 I've been to Dubai a couple of times and each time have booked a tour with city one tours. This time I booked my tour with Arun Mohan and he definitely did his job very well! These guys are professional and friendly. From initial contact made at the airport to the desert safari and all the other things we did, they were amazing, friendly and reliable. They make the whole Dubai experience very convenient and the holiday very easy to enjoy. 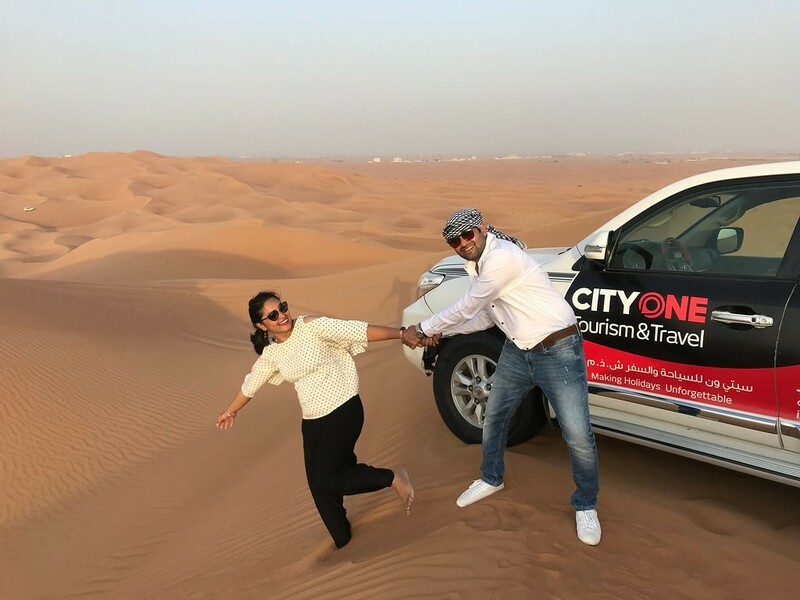 Will definitely always book my dubai tours with city one tours. Will also really recommend Nasrullah for the desert safari and the amazing pictures he takes there. My best friends came from Pakistan. Today we went to desert safari with a guide name Nasrullah. He was outstanding and experienced guide. He was a great personality. It was one of the best safary jorney with Nasrullah. Very careful driver, good car, good programm. Several impression at the same time - safari in dessert, photo at the top of the barkhan, trip on camal, very professional dance show in the camp. Nasrullah was very helpful, safe, high professional driver and guide. A lot of stories, good mood, thanks a for everything. My grand mom did Desert Safari with City One, we were not sure if it is ok, Devi assured that it is doable. It was a fantastic experience for my grand mom. She enjoyed the dune bashing, photos with falcon, and entertainment shows. We all were extremely pleased to see her happy. Me and my family had our desert safari on a day it had rained in the morning. Inspite of it, Mr. Khalid Khan being highly experienced gave us an amazing dune dashing experience. He was very informative, extremely helpful and made our tour hassle free and comfortable. The trip had started and ended promptly. The tanoura, fire show and belly dance were the other worth mentioning highlights. I would definitely recommend City One tours and Mr. Khalid khan for anyone looking for a personalised, experienced and comfortable tour. Excellent experience. Driver was also very helpful. Good food, free Heena, ambience etc. everything was perfect. We booked from a local travel agent in Uganda and the entire package was operated by City One. I generally don't write reviews but this experience was very good. From the airport pickup to our guided city tours and the best was the desert safari. We have been to Dubai earlier, but this experience was by far the best. The team was very friendly and did their best to make sure we had a great holiday. We had booked all our excursions on a private basis, so that did make a difference. Would recommend them without a doubt and suggest that you insist on taking tours with them for the quality they provide. Unbeatable and Unequalled - tried the rest and now found the best!!! These guys excelled and have thought about the very minutest detail. They are beyond doubt the best in the region and best AED1300 I have ever spent in the UAE. Would not hesitate to do it again - my 5 year was a little nervous at the beginning of the dune bashing and Mr. Khalid picked up on this and adapted his driving accordingly until my lad was comfortable an begging for more. Enjoy a personal experience that you won't find with the other large tour groups!!! If you want to decide to go on desert safari, please ask about Kalid Khan, driver from Pakistan. Very good english, very nice guy and very professional driver. If you want to adrenaline, he can give you :). Awesome experience of the sun downer safari....amazing trip planers...thnks for d best itenary...in one word it was worth our trip wid city one tourism and would highly recommend to book with them. The desert safari is a must do in dubai! It was an unique experience and I had so much fun! A big thank you to our amazing guide nassullah, which made this experience unforgettable. It is slightly old story, a story of my old grand ma. She was on a 3 months trip to UAE and it has been already two months that she is back home. during the Desert Safari arranged by them. You read it right.. my grand mom did dune bashing with City One.. It was a nice experience. The desert is a dream and drifting wiht de SUV was very funny. Our guide Nasrullah is a very kind man with a greath sense of humor. While we drove to the desert, he explained us the buildings and intresting things about Dubai. Took a Desert Safari with City One, I am a resident and wanted my visiting friends to have an adventurous dune bashing. Browsed through www and based on the reviews choose City One. Liked them from my first interaction...Arun was giving some expert tips on planning our trip, was reachable and very flexible. The dune bashing experience was an amazing roller coaster ride in desert. The driver was amazing, kind and very courteous. He also took some amazing pictures for us and was very experienced. Thank you Arun and City one. Definitely recommend City one. I really enjoyed the Desert safari Provided by Cityone tourism and travel. The driver, Nasrullah Khan was an amazing guide. He gave us knowledge about the jail and other important destination that came on the way. Cityone tourism and travels provided with many activities like heena, camel ride etc. It is lifetime experience. My Mom (71 Years Old) & Sister visited Dubai and tried Desert Safari Tour along with my Wife and Two children (8 & 5 Years Old). Considering that this is my 14th Desert Safari Tour, CITYONE is the BEST! Excellent & Courteous Staff from reservations or bookings up to their Driver, Cleanliness of the Camp and Amazing Performers/Entertainers. Everyone Enjoyed it! We will definitely do it again once Friends and Relatives visit us here in Dubai. More Power CITYONE!!! The tour Was amazing , the Food delicyus, every thing Was perfect. I recomend this company and specialy this driver for every one !! Thanks a lot Khalid , i make our trip Better !! 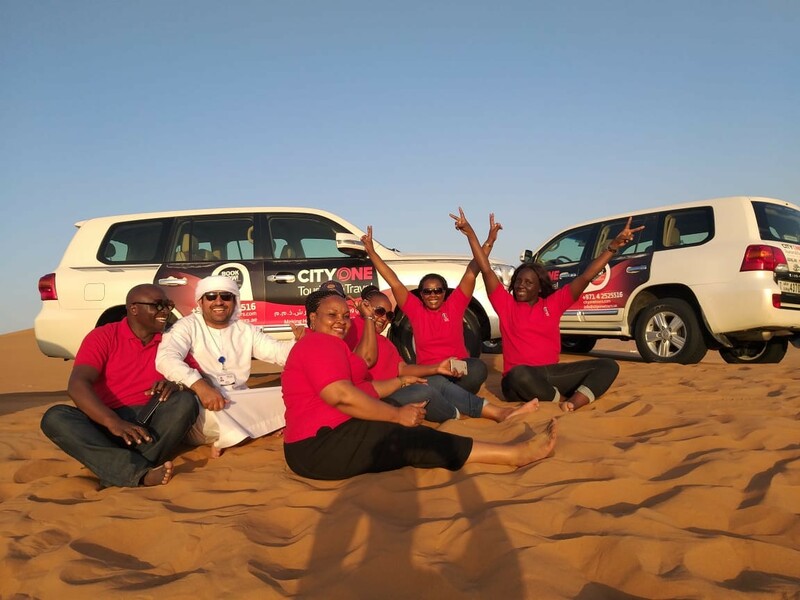 My experience about Desert safari with CityOne tours was great. Got picked up at the dot the guide nasrullah gave us a very adventurous trip. His experience in desert driving was excellent and we enjoyed a lot. The shows were amazing and the dinner was great. We thank Mr. Latiff and his team for making this a great trip for us.